Initially I'd be at the lot on the 9th & 10th to wrap up the showcase but GMBB has offered me to have the works stay longer than the original timeline (10th) so I'll be extending the official showcase until the 13th instead! Hence, I'll be at the lot on the 12th and the 13th instead of 9th/10th, 12pm-8pm. Of course, it is still available for public viewing everyday from 10am-10pm. All purchased artworks will be sent/mailed after the 13th onwards accordingly. Masih Segan, or ‘Still Shy’ in Malay is a wrap-up showcase for the collection of watercolour paintings originally crystallized at my Rimbun Dahan’s residency. Comprising of all new, never-been-exhibited-and-seen works, it will be an extension and also a sort of a closure for the stay the original series, Segan has had at GMBB. As a further inspection to Segan’s original theme of passivity, vulnerability and quietness, it will further bring the viewers and audiences on the roots of the series. What does it really mean to be vulnerable and passive? What good comes from focusing on these usually unflattering parts of us instead of the other way around? With the artist’s talk and tour, I hope to further enlighten and lay down some touchstones for them. In conjunction with the wrap-up showcase, I will also be launching the Segan art book and also will be hosting a little artist’s talk and tour on the overall series and works during the opening reception. Find your way to the venue via Waze or the guide here. 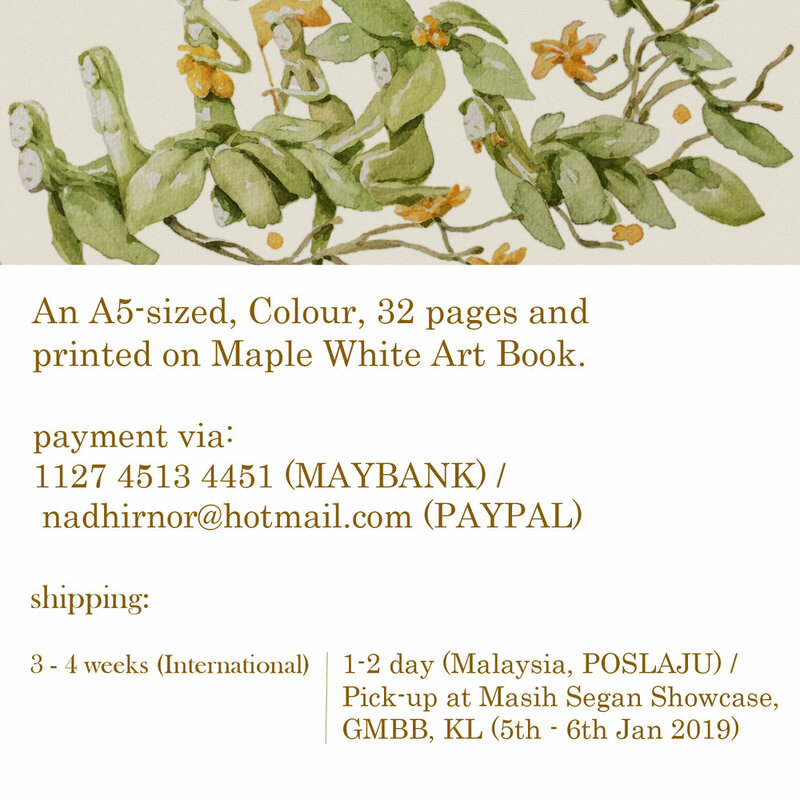 If you’d like to know more or have any inquiries, feel free to e-mail me at nadhirnor@hotmail.com. Do RSVP and get more updates on the event here. In conjunction with the showcase, I will also be releasing Segan the art book, it will be a sort of an archive of the previous and some unpublished pieces with a little bit of writings surrounding the themes and contemplation that shaped and fertilized the series. Pre-order now and pick it up during the showcase, each pre-order comes with a complimentary print and a raffle for an original watercolour piece.